When a nun in our monastery makes profession the day is usually taken up with guests, reception and then clean-up! Lest the community be left out of celebrating we have a special day after the big day just for us! Yesterday was a full day of recreation (outside of the hours of prayer, of course) to celebrate the wonderful gift of Sr. Mary Amata's Solemn Profession. We enjoyed the rare opportunity to relax and chat, go for a walk, play a game or two...or three, and feasted on the scrumptious things that the kitchen sisters provided. 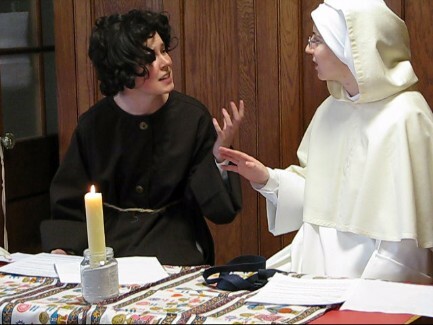 At the last minute the novitiate sisters got together a hilarious skit for our entertainment. Weaving together fact and legend and placing it in several centuries and places at once we learned the REAL story of how the Order of Preachers and Order of Friars Minor came to be! What added to the hilarity is that Sabina immediately ate up a prop that was thrown to the ground (a "bird made of kleenex! )and one novice (who? We're not telling!) was enjoying the skit so much she forgot to come out with her ONE LINE that was the punch line! We suspect that there will be more "Dom and Frank" skits in the future. The day ended with an old custom on community feast day celebrations--Bingo, monastery-style! This probably started long ago because after an entire day of talking we pretty much have run out of things to say by evening! Monastery Bingo is always led by the prioress (!) and each sister has a card given her when she entered. These cards are at least 50 years old if not older. We also receive an old aspirin bottle of buttons! While the game is fun it's the repartee, quick retorts and mis-heards that make it worth playing. Besides, you don't have to think too hard! The day ended with thanks and praise to God and to our Blessed Mother for the gift of Sr. Mary Amata's definitive commitment, asking for the grace of final perseverance for each of us! 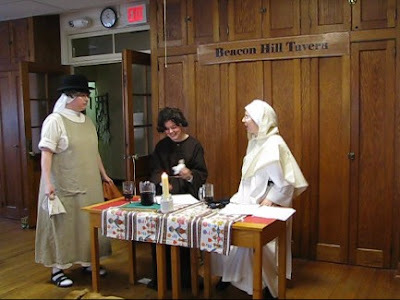 Jeeves with a bowler hat serves ale at the (Summit) Beacon Hill Tavern to St. Francis and St. Dominic! Meanwhile the cooks provide their own entertainment! Could that be Sr. Joseph Maria? When Sr. Judith Miryam cooks you know it will be good. Our Wednesday abstinence was suspended and we enjoyed a succulent rib roast! Hmmm! Thank you, Sr. Judith Miryam!